Home > Getting Started > Are You Wearing the Right Footwear? Forget expensive clubs or rackets, top of the range bikes or the latest range of Lycra. When it comes to sport, the human body is the most valuable piece of equipment to be found in the locker room. It’s irreplaceable, too: so ensure that when you head out onto the field of play you have done everything possible to avoid injury. Success in sport, as in many other fields, means starting at the bottom, building upon solid foundations. In this case, that means ensuring that you have the correct footwear for your chosen activity. Not only will the right shoes provide comfort and ease of movement, but they will guarantee grip and stability. There is, for example, a reason why studs and spikes are a component of footwear designed for football, rugby, cricket and golf. You won’t find a professional footballer negotiating a greasy or well watered pitch in a pair of indoor trainers as he or she is likely to end up on their backside when they attempt to turn or break at speed, due to the flat sole of the shoe. Not only is their stability compromised but the fall could result in a nasty injury. 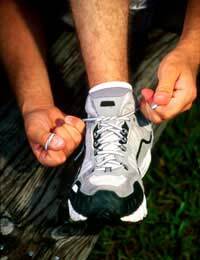 Tennis shoes also take account of the need for better grip on a grass surface through the use of moulded pimples. While this type of sole would not be appropriate for an indoor surface, or outside on clay or cement, it allows the feet to stay anchored when, for example, the player has to lunge low to their right or left to execute a fore- or backhand. Again, the danger of one or both feet slipping from underneath the player could result in something more serious than a bruised ego. The potential for injury is also the motivator behind developments in running shoe design. The impact upon the ankles, knees and hips of surfaces such as Asphalt and cement means that cushioning and support should be the main considerations when purchasing. Thankfully the proliferation of high-street stores devoted specifically to running means that expert advice is not difficult to find. That advice should be heeded, too. Those who graduate to specialist disciplines such as fell running will find that good grip, waterproofing and a more durable sole are the key features of the footwear specifically designed for the activity. What about sports that do not require regular impact between foot and surface? Cycling is the obvious example, and here, too, it is worth taking careful consideration of what you put on your feet. Road running shoes – a regular sight on casual riders - are not the way forward. They may provide cushioning against the push of the sole of the foot against the pedal, but that cushioning also reduces the amount of “feel” that allows the rider to interact efficiently with the machine. The opposite is true of that other stand-by, football trainers: the relatively thin sole allows for more “feel” but that thinness means the feet will quickly begin aching. The answer is to invest in either a pair of cycling trainers with a thicker, flat sole, or footwear that incorporates a cleat that locks the foot into the pedal and promotes more efficient interaction between man and machine. In common with fell runners, the waterproof properties of a shoe are an important consideration for cyclists. Sailors, climbers and skiers will also put great emphasis on a shoe’s ability to prevent water ingress.Don’t forget, of course, to ensure that sports shoes are the correct fit - otherwise an undignified limp from the field of play is very likely. It is always a good idea, for example, to ensure you take a pair of your socks with you to the fitting room because thicker varieties such as football socks may influence the size of shoe that you need. Investing in the right shoes may not come cheap, but it is an investment that will pay handsome dividends not only in preventing injury but ensuring that you are able to maximise your ability.